Making Payments for Invoices is easy as 1-2-3. If you have read the Getting Started Guide for Invoices, skip to the Making Payments Section. Get Started and Manage your Invoices with ease. Follow these Steps to Get Started and Viewing your Accounts Invoices. Login by entering your Login ID and Password or your Social Media Account. Once logged in, click on the “Menu” Icon on the Top-Right. Your Accounts Dashboard and Menu will be shown to you as shown below. Click on “Invoices (Due Invoices)” or “Invoices (Total Due)”. 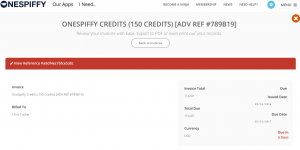 The Invoice Panel will be shown to you with all Invoices Due and Paid, as shown below. Click on “View” beside any Invoice to View the Invoice Details or Make Payments. Ensure all the details for your Invoice are correct and scroll down to process payments. or to make payments via PayPal.Please note additional fee’s may apply for PayPal Payments. Once the transaction is successful, a receipt will be provided.